The first volume of this set of Coomaraswamy's architectural writings, Ananda K. Coomaraswamy: Essays in Early Indian Architecture (1992), for the first time collected Coomaraswamy's important work - based on a probing analysis of available sculpted reliefs and texts - on the terminology, planning, morphology, and construction of urban, vernacular, and sacred architecture in ancient India. This second volume, Ananda K. Coomaraswamy: Essays in Architectural Theory, presents inconsecutive form the essays that best represent Coomaraswamy's rapidly developing thinking on the hermeneutics of architecture - its "why" not "how." These can best be understood in the order in which they were written. As Michael W. Meister says in his Preface, "Only by being presented in such a fashion can Coomaraswamy's architectural ideas accumulate a structure comparable to their substance." 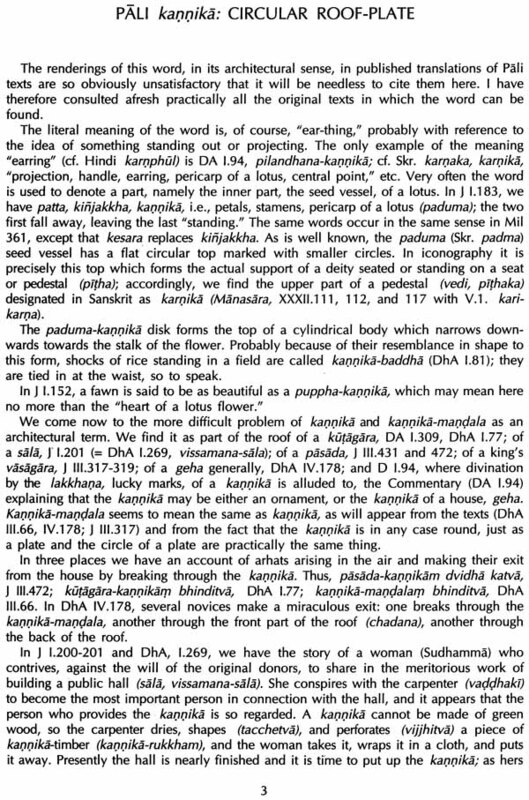 From a discussion of the "Pali kannika: Circular Roof-plate" of ancient wooden construction in 1930, Coomaraswamy moved on to a much more widely ranging metaphysical exploration of "The Symbolism of the Dome" (1938). He made a conceptual leap to connect the physiognomy of costume with architectural meaning in his essay on "Usnisa and Chatra: Turban and Umbrella" (1938); profoundly connected "decoration" to essential meaning in "Ornament" (1939); and extended the "significant form" of architecture to that which transforms men in "Svayamatrnna: Janua Coeli" (1939). 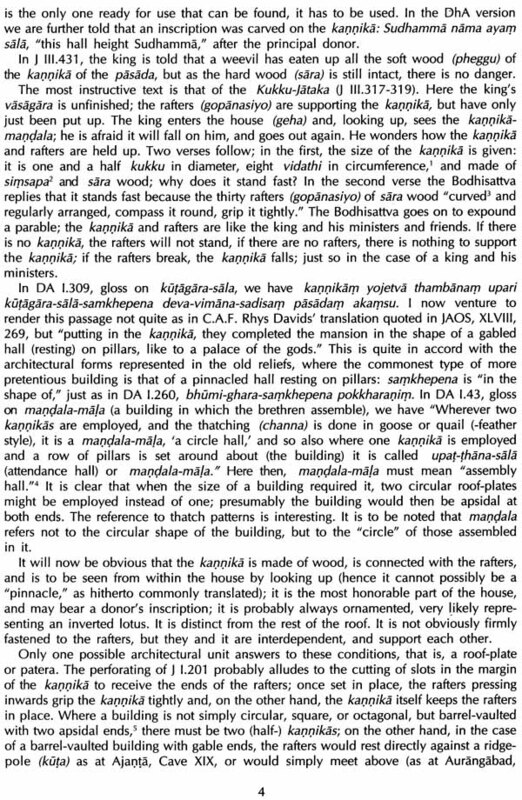 A summing-up essay on "An Indian Temple: The Kandarya Mahadeo" (1947), published in the year of his death, placed the form of the temple at the still center of Coomaraswamy's thought. In his introductory essay, "Architecture as Ornament, Essential Form," Michael W. Meister explores Coomaraswamy's attempts to "test the essential link between principal and necessity" in architecture and posits the dictum that if "form is ornament, therefore form has function." 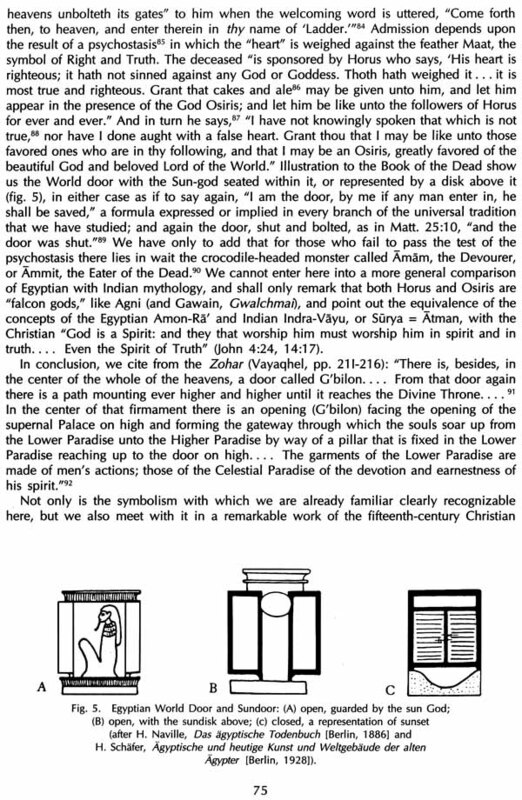 An example of the early scientific substrata of Coomaraswamy's thinking, "Ancient Iron Beams in India" (1912) appears as an Appendix. The Indira Gandhi National Centre for the Arts, New Delhi, has undertaken a long- term project to bring out the complete Collected Works of Coomaraswamy in thematically arranged and re-edited volumes. This is the tenth volume to be published in the series. MICHAEL W. MEISTER, editor of these volumes on Coomaraswamy's architectural thinking, is Professor of South Asia Regional Studies and Chairman of the Department of the History of Art at the University of Pennsylvania in Philadelphia. He has also edited the Encyclopaedia of Indian Temple Architecture (1983-92), Discourses on Siva: Proceedings of a Symposium on the Nature of Religious Imagery (1984), and Making Things in South Asia: the Role of Artist and Craftsman (1988). His essays "On the Development of a Morphology for a Symbolic Architecture" (1986), "De- and Re-constructing the Indian Temple" (1990), "Fragments from a Divine Cosmology: Unfolding Forms from India's Temple Walls" (1993), and "Sweetmeats or Corpses? 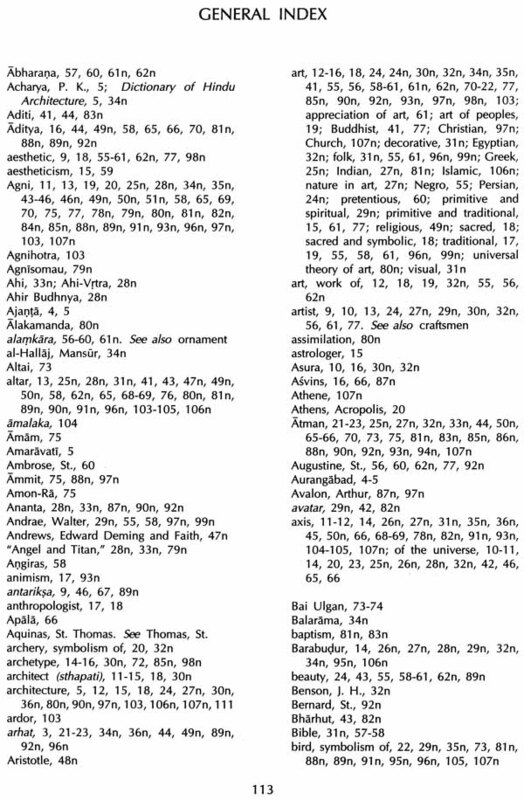 Art History and Ethnohistory" (1995) as well as a series analysing the meaning and structure of Indian temple plans, have extended the work of earlier scholars such as D.R. Bhandarkar, Stella Kramrisch, and Ananda Coomaraswamy and attempted to bring the study of Indian architecture and architectural sculpture into a world of contemporary discourse. He has lectured in India at the Indira Gandhi National Centre for the Arts (New Delhi), the School of Architecture (Ahmedabad), and the Prince of Wales Museum (Bombay). The fourth in the series of the Collected Works of Ananda Kentish Coomaraswamy was a collection of Essays in Early Indian Architecture. The theme is taken forward in this volume. The essays included represent the maturing Coomaraswamy, who moves beyond form and function to metaphysics and the contemplative life of the spirit. These essays have to be placed in relation to Coomaraswamy's concerns in the Transformation of Nature in Art as also those articulated in the volume on Yeksas: Essays in the Water Cosmology, sixth in the IGNCA series of the Collected Works of Ananda K. Coomaraswamy. The six essays, some published in Volume I of Coomaraswamy's Selected Papers, edited by Roger Lipsey, move, no doubt on the level of pure function and form, e.g. the "Pali kannika: Circular Roof-Plate"; "Usnisa and Chatra: Turban and Umbrella"; and "Svyamatrnna: Janua Coeli"; and "Ornament." However, their importance lies in Coomaraswamy identifying the essence of the conceptions and their antecedents in the tradition not only in built stone, but also in Vedic ritual and verbal discourse in early Sanskrit and Pali literature. 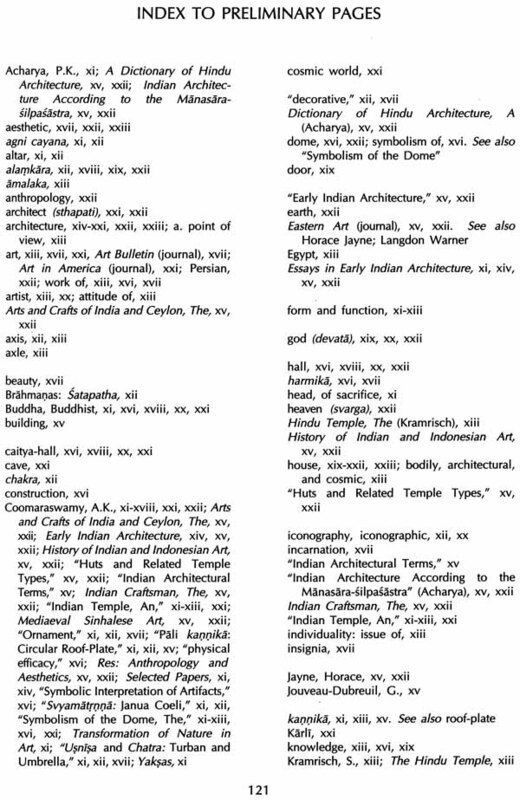 The essay on "The Symbolism of the Dome" and "An Indian Temple: Kandarya Mahadeo," although written at different periods (1938 and 1947 respectively) constitute a separate group where Coomaraswamy examines total structures and the architectural metaphor in stone. Michael W. Meister appropriately points out in his introduction that A. K. Coomaraswamy was now asking the why "rather than how." Ananda Coomaraswamy's ability to make these connections between Vedic ritual and textual source, Upanisadic and Buddhist, is seen at its most awe-inspiring in the essay on "Svayamatrnna: Janua Coeli." Clearly Coomaraswamy places his finger with uncanny insight into Vedic ritual and the relationship of laying down of the three self-perforated bricks in the fire Altar (agni cayana) and its symbolic meaning of passing from life to death and beyond as in the case of roof plates. If, in fact, we should subtract from the most spiritual and intellectual forms of religious doctrine all that is in the last analysis of prehistoric origin, if we decide to reject "participation," and to think not really but only logically (to reverse the Scholastic "logically but not really"), very little will be left of what we are accustomed to think of as spiritual values. If we entertain such values still, it is because we have inherited them, not because we have created them. Whoever will study the Urmythos dispassionately and apart from wishful thinking in terms of "progress," will be convinced that we cannot separate the content of the myth from the fact of its first enunciation, and will realize that it is only with difficulty that we, from our narrower point of view, can raise ourselves to the level of reference of the prehistoric "myth making age." Also, this essay makes it clear that Coomaraswamy is no longer restricting himself to understanding function and form, but has moved to essence. As I have pointed out in the previous volume in this series, Ananda K. Coomaraswamy: Essays in Early Indian Architecture, published by the Indira Gandhi National Centre for the Arts (1992), Coomaraswamy first took interest in the traditional practices of building in South Asia in his two early studies on Mediaeval Sinhalese Art (1908) and The Indian Craftsman (1909). He gave traditional architecture an excellent general frame in his hand- book on The Arts and Crafts of India and Ceylon (1913) and further elaborated on the theme in his History of Indian and Indonesian" Art (1927). The publication of P. K. Acharya's A Dictionary of Hindu Architecture (1927) and Indian Architecture According to Manasara-silpasastra (1928) helped to focus Coomaraswamy's attention on the availability of textual sources for architecture and he addressed the problems of establishing a technical terminology for the first time in his review of Acharya's two volumes in the journal of the American Oriental Society, "Indian Architectural Terms" (1928), which was included in the previous volume in this series.' There Coomaraswamy praised the French scholar Jouveau-Dubreuil for his "thorough knowledge of the actual architecture" and "personal contact with living sthapatis [practitioners] able to explain the meaning of technical terms," commenting that "without these qualifications Professor Acharya has attempted an almost impossible task, for here book-learning, however profound, is insufficient." Coomaraswamy admitted that he himself had "in preparation a work" based on the "very great deal of exact information about the early architecture [that] can be gathered from the Sunga, Kusana, and Andhra reliefs." This was eventually embodied in the three articles on "Early Indian Architecture" that appeared in Eastern Art, an Annual published only briefly by the College Art Association in the early 1930s. 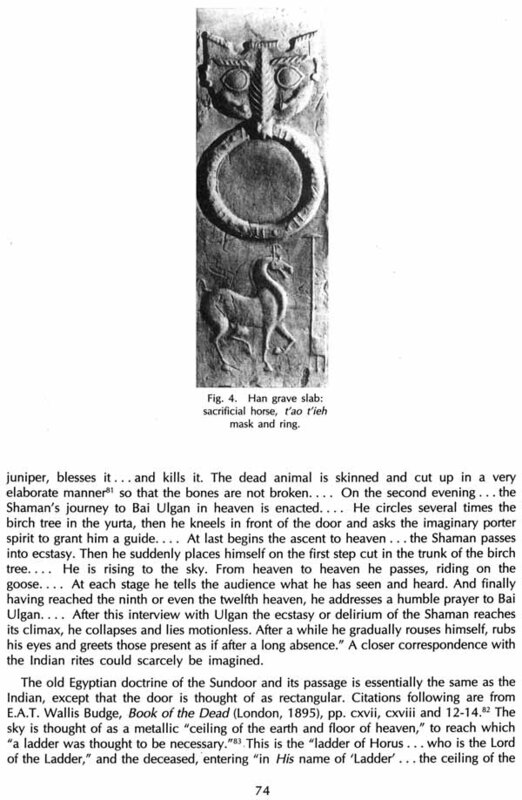 This ceased publication before Part IV on "Huts and Related Temple Types" could appear. This final essay was first published in Res: Anthropology and Aesthetics only in 1988 and all four parts appeared together for the first time in the Indira Gandhi National Centre for the Art's volume, Ananda K. Coomaraswamy: Essays in Early Indian Architecture in 1922. These four seminal essays were clearly a work in progress, rapidly recording the results of Coomaraswamy's wide-ranging visual and textual explorations in a period when he was moving toward a phase in his personal and scholarly life where the dense entanglements of philosophic texts would become his greatest obsession. His explorations of early architecture - both its imagery and terminology - were thus an important methodological transition from his early archaeological obsessions to the mental layerings of his metaphysical works." The last phase of his earlier methodology, however, can be seen in his brief note on "Pali kannika: Circular Roof-Plate" from the journal of the American Oriental Society (1930) with which this present volume begins. In this, his analytic vision clearly has grasped the functional meaning of a difficult term, bringing together the practice of wooden architecture in India with Coomaraswamy's knowledge of the textual tradition. He, with great specificity, sufficiently explains one single element, the roof-plate (fig. 1), with reference both to construction and to its textual naming. In his essay on "The Symbolism of the Dome" (1938), however, he proposed instead, he writes, to ask rather "why than how. It is "not by means of the empirical faculties ... ," he goes on: but intellectually that the formal cause is apprehended in an imitable form. We [consider] the dome ... primarily as a work of the imagination, and only secondarily as a technical achievement." How then can we propose to explain the genesis of the forms embodied in works of art only by enumeration of the material facts and functions of the artifact? To take a case in point, it is certainly not by purely "practical" considerations that one can explain the position of the harmika or "little dwelling" ... immediately above and outside the apex of the stupa [see. fig. 2]; whereas the raison d'etre of this emplacement becomes immediately evident if we understand that... all that is mortal [is] contained within, and all that is immortal exceed[s] the structure." Finally, inasmuch as turban and umbrella are both of the nature of insignia, and at the same time is protections from rain or sun, we recognize in them what can always be seen in the artifacts of normal men, an indivisible linking together of use and meaning, physical structure and metaphysical reference. We know that in traditional philosophy the work of art is the reminder; the summons of its beauty is to a thesis, as to something to be understood, rather than merely enjoyed. . . . [O]ur modern preoccupation with the "decorative" and "aesthetic" aspects of art represents an aberration that has little or nothing to do with the original purposes of "ornament."